To celebrate my grand opening, I am giving away one of my sets of Three Owl Finger Puppets! The winner will choose any owl puppet set from my shop as their prize, an estimated value of $3.50. These finger puppets make perfect stocking stuffers or party favors. Leave a comment telling me which set you'd choose to unlock bonus entries using Rafflecopter! See the Rafflecopter system below to enter to win, be sure to leave a name and valid e-mail address so I can contact you if you win! Contest ends on November 18 and is open to US Residents only. I'm not seeing the rafflecopter? The orange, blue and green! 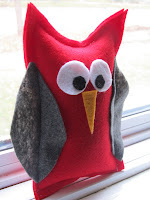 I think my 3yo would LOVE a set of 3 owl puppets! I like the pink/blue/orange or the green/pink/purple sets the best for the wide range of colors. These things are SO cute!! I'm so excited you set up an Etsy shop! I actually have a stockpile of completed crafts sitting in my sewing room for local craft shows, but I haven't taken the plunge into Etsy. Why is it so scary to me? I LOVE the gray, red, and purple set, so much so that I am highly tempted to add them to my rolling total in my current shopping cart. In fact, I think I will, lol. We would love the blue, yellow, and green set. So cute! So precious! We would love the blue green and yellow set! I love the green, pink, purple guys. But I love them all. Incredible price!!! I'm going to send lots of parents from our kindergarten to you for Christmas. Pink, orange and blue. Because pink is Lilly's second favorite color, and orange is Dulce's second favorite color. My son would love the mini stuffed grey owl. These are so adorable! Pinned and tweeted! SO CUTE!! 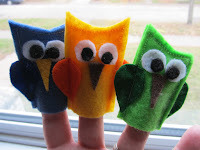 My oldest is a nut for owls, she'd love the green/pink/purple set of finger puppets. I'd choose the blue, yellow, and green. Definitely the set with the pink owl! I like the blue, yellow, and green set. AH! They're all so cute. I like the eggplant, brown & blue. Great idea - so creative. i like the one with the pink blue and yellow beacause those are all my favorite colors! I like the purple, green and pink set! They are so cute! I shared on Facebook and tagged you, but I'm not very good at it, so I hope it worked. 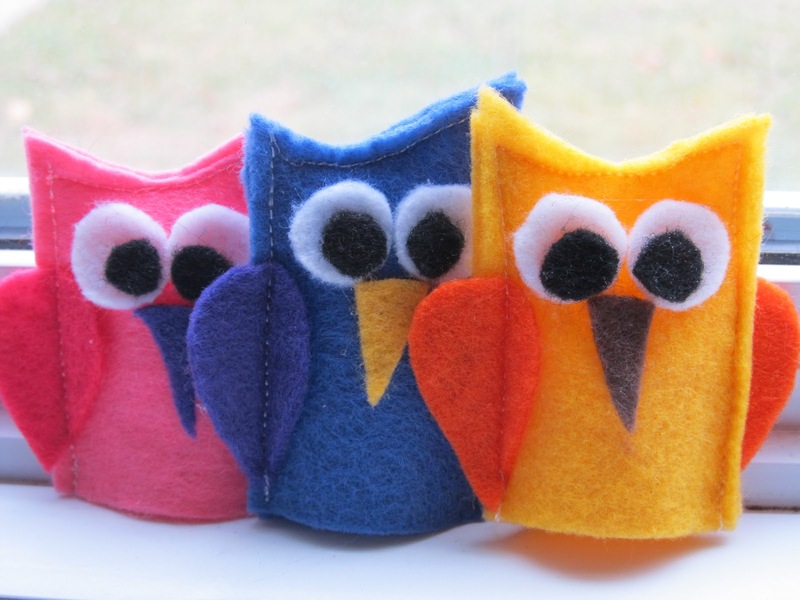 http://www.etsy.com/listing/114363485/felt-owl-finger-puppets-set-of-3 would be my choice. How cute! My first choice would be the Pink, Blue, Yellow.